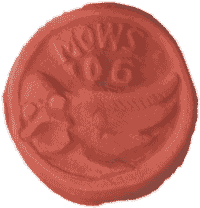 How many of these MOWS patches below do you own? We've been doing this since 2003. We love being a small, local event! 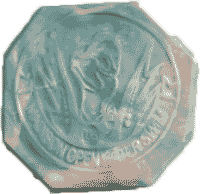 During the first four years, race participants made their own finisher medals from clay after the event. Since then, we changed to our well known "little duck" finisher medal and a local artist/swimmer creates our four one-of-a-kind overall winner awards every year. 1.2 and 2.4 mile distance held August 18, 2018 at Law Park on Lake Monona. His fees are quite reasonable and you may purchase whatever you would like. 1.2 and 2.4 mile distance held on August 15, 2015 at Law Park beach on Lake Monona. 1.2 and 2.4 mile distance held on August 16, 2014 at Law Park beach on Lake Monona. 1.2 and 2.4 mile distance held on August 17, 2013 at Law Park beach on Lake Monona. 1.2 and 2.4 mile distance held on August 18, 2012 at Law Park beach on Lake Monona. 1.2 and 2.4 mile distance held on August 20, 2011 at Law Park beach on Lake Monona. 1.2 and 2.4 mile distance held on August 21, 2010 at Law Park beach on Lake Monona. 1.2 and 2.4 mile distance held at Law Park beach on Lake Monona. 1.5 and 3.0 mile distance held at Governor Nelson State Park beach on Lake Mendota. 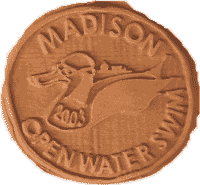 The first Madison Open Water Swim was 1.5 and 3.0 mile distance event held at Governor Nelson State Park beach on Lake Mendota. The course was 0.75 miles and swimmers went around the course either 2 or 4 times for a 1.5 or 3.0 mile swim. 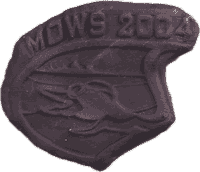 After the swim, participants were able to create their own participation medals out of clay, which was then baked (hardened) on site. There were 41 swimmers that first year and we have the very first race results.